In the three days before Humble died, he had been scheduled to receive 15 separate drug treatments, including anti-inflammatories, corticosteroids, and muscle relaxants, according to his medication chart. Read the full investigative report on drugs in the horse show industry at The New York Times. 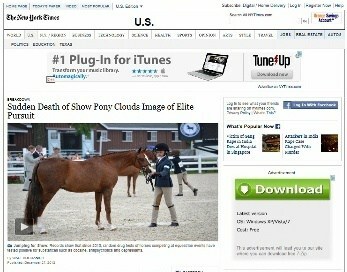 A version of this article appeared in print on December 28, 2012, on page A1 of the New York edition with the headline: Sudden Death of Show Pony Clouds Image of Elite Pursuit. Horse Authority (formerly Rate My Horse PRO) broke the news regarding Humble’s death at the 2012 Devon Horse Show. We led with exclusive news reports, including USEF’s inaction.